It's the end of the semester, and it's time to reflect on the work that one does as a teacher. My running has suffered a bit this spring, but it's because I've been working a lot on my other passion, which is philosophy. Though I know that most of the folks who read this blog are runners, I thought that some reflections on teaching wouldn't be inappropriate, as connections can be drawn between the sort of intelligence that it takes to train well and the sort of intelligence it takes to teach well. Both are difficult and vague tasks, they require listening as much or more than knowing. Both also take a sort of faith that things really are working. The material that the teacher works with is much like the body--dark, resistant to intelligent control, possessed of wild and diverse instincts. Just like students, our bodies have minds of their own, our relationship with them has to be as receptive and open as it is controlling and directive, and the best training depends on developing a partnership with this essentially unknowable quantity. The rewards, however, are sweet, and they show themselves towards the end of a process that is often messy. In the end it is not a straightforward quantity that is produced, not a direct and measurable outcome, but a set of capacities. In running, these capacities are demonstrated in a race, in a performance that pays the capital that training accrues forward in inspiration. When we run well, we inspire others, sure. But perhaps more importantly, we inspire ourselves, and we can carry that moment of inspiration with us like a secret lantern that lights us up from within and illuminates a way into the messy project of renewing the self once more. Steve Prefontaine doing his work. In teaching, success holds to a similar pattern. As teachers, we find our inspiration towards the end of the semester, when our students begin giving back to us the questions we gave to them. If we are lucky, we find ourselves challenged and inspired and renewed because we have created a community of folks who can speak to our own worries, who help us think through our most difficult questions in different and exciting ways. 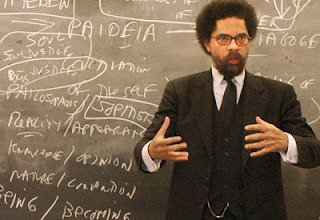 Cornel West doing his work. In this way, we demonstrate the continuing power of the ideas we have picked up through our own education to animate the minds of further generations of people. If we are lucky and things more or less work out, we get to see the power of our own intelligence reflected back, just as a well-run race can reflect the power of our bodies. This moment of insight is not best understood as satisfying narcissism or neediness (though these are real dangers for teachers), but as a moment of gratitude for the small things that we can offer to the world--and relief, in many ways, that the world will accept our offerings. So much of what we are rewarded for in professional philosophy has very little to do with a genuine practice of philosophy. Just as running so often seems a waste of human energy, so too can philosophy seem a waste of human intellect. The value of each of these practices is indirect, difficult to measure, and can even appear absurd. So, we do the next best thing and measure journal articles published or compare PRs. Of course, those of us who chose the path of philosophy had already decided that we were not driven by external rewards (no matter how much we regret this decision at times!) but by the distinct pleasures of thinking new thoughts--and by the idea that keeping the moments of inspiration that philosophy gave us alive for ourselves and for others is a meaningful way of putting ourselves to use. That's teaching, the work of philosophy. I wish you were my teacher, Jeff. Ha, I know I'm a total cheeseball. earlier today this post read somewhat differently. Yeah, I decided to take down the email to the student--just didn't seem right on reflection.... Apologies! there was a lot of good stuff in that section. Yeah, there was. I commented on part of the e-mail, but then on (similar?) reflection, did not post the comments.